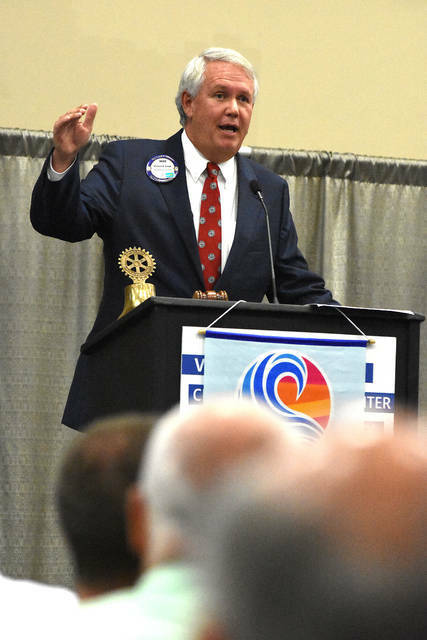 Mike Swick, President and CEO of Lima Memorial Health System addresses the Lima Rotary Club luncheon on Monday. LIMA — Health insurance has become something that Americans are struggling to afford but often feel entitled to, according to Lima Memorial Health System President and CEO Mike Swick. Healthcare spending in 2016 has increased by 4.3 percent, amounting to $33 trillion, according to Swick. By the year 2025, it is estimated that a family of four with an annual income of $70,000 will not be able to afford their copay. Last year, Lima Memorial Health System generated $3 trillion in economic activity in the community and donated $37 million to charities. Aside from unaffordable healthcare, there has been a shortage of between one and two million nurses since 2014, with that trend expected to continue until 2022. In addition to the nurse shortage, by 2025, there will be a shortage of 130,000 physicians. In order to recruit and retain highly-qualified associates, Swick believes that healthcare organizations need to develop ways to engage, educate, and recognize them, as well as create a favorable work environment. Currently, health care systems like Lima Memorial are focusing more on outpatient care, according to Swick. Additionally, healthcare systems are moving toward electronic medical records, patient portals and telemedicine, which will allow patients to communicate electronically with their physicians as opposed to meeting in person.